The native ferns that form a lush green understory in coastal redwood forests are well adapted to dry summers and periodic droughts, but California's current prolonged drought has taken a toll on them. A comprehensive study of water relations in native ferns, conducted during one of the worst droughts in California's recent history, shows that extreme conditions have tested the limits of drought tolerance in these plants. "We've seen permanent dieback in some patches," said Jarmila Pittermann, associate professor of ecology and evolutionary biology at UC Santa Cruz. 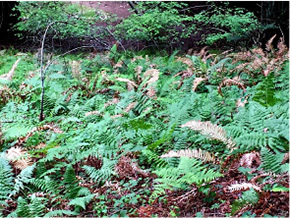 Pittermann's lab is studying ferns in the redwood forest on the UCSC campus. 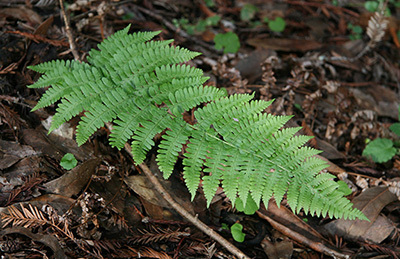 Over a period of 15 months in 2013 and 2014, the researchers closely monitored ferns at their study site, focusing on two common species in the redwood forest understory: the western swordfern (Polystichum munitum) and the coastal woodfern (Dryopteris arguta). "These understory species are important in themselves, but also serve as indicators of how climate change may affect our redwood forests," Pittermann said. "Considering that these plants are adapted to persist through a typical summer dry season, the dieback emphasizes just how unprecedented this drought has been over the past three years." Her team collected data and samples at the study site every 10 days, including measurements of soil moisture, leaf temperature, hydration status of the plants, and how efficiently water moved through the fronds. They also conducted greenhouse experiments and laboratory tests. The results, published in New Phytologist, show that the fronds of these ferns can almost entirely lose the capacity to transport water by the end of the dry season, yet they can recover within 24 hours after a heavy rain. Despite this remarkable physiological resilience, however, an extended drought limits the plants' ability to photosynthesize and store energy. As a result, they may develop fewer new leaves in the spring and be more vulnerable to insects and diseases. Ferns and other vascular plants transport water from roots to leaves through a system of pipe-like conduits called xylem. When a plant starts to experience water stress, its first response is to close the pores in its leaves. This reduces water loss, but also blocks the uptake of carbon dioxide needed for photosynthesis. Under extreme water stress, the plant's hydraulic system starts to break down as air bubbles form in the xylem, causing "embolisms" that block water transport. "We found that during the worst part of the drought in 2013, these ferns had extensive embolisms that severely compromised the ability of the xylem to conduct water," Pittermann said. Although many plants would have a hard time recovering from this condition, the native ferns were able to recover quickly after heavy rains. Nevertheless, the extended periods of water stress during the drought greatly reduced their ability to conduct photosynthesis and perhaps their capacity to produce and store adequate levels of sugars and other carbon compounds in their underground rhizomes, Pittermann said. "These plants are not accumulating enough carbon to support new growth in the spring," she said. "The implications are that they may not make enough spores to reproduce, and they may be more vulnerable to pests." Pittermann and others have noticed an increase in infestations of thrips, tiny insects that feed on plant sap, affecting ferns during the drought. 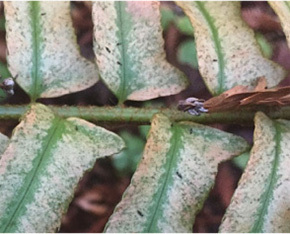 Other observers in Marin County have reported thrips infestations and dieback of ferns in that area's redwood forests, including popular tourist sites such as Muir Woods. The new study is the first of its kind in ferns or understory plants in general, and Pittermann has received funding from the Save the Redwoods League to conduct further research. 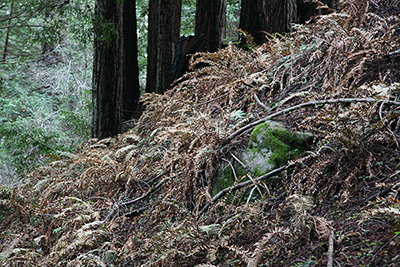 The redwood forest ferns may be an important indicator of ecosystem change, she said, and continued drought could lead to a very different type of understory and might even threaten the redwoods themselves. "Redwoods are not deep-rooted trees, so an extended drought will eventually affect them too," she said. In addition to Pittermann, the coauthors of the paper include graduate student Alex Baer (first author) and postdoctoral researcher James Wheeler. This research was funded by the National Science Foundation.